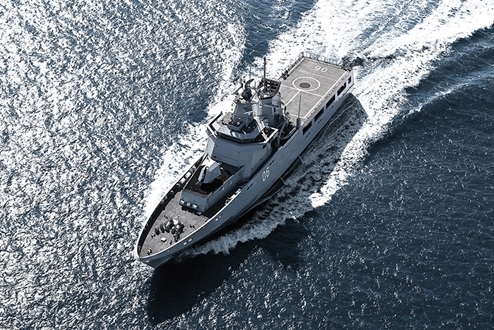 Ft. Lauderdale, Florida USA – December 4, 2018 Quantum was recently awarded the stabilizer contract on the first of 12 Offshore Patrol Vessels (OPV’s) for the Royal Australian Navy, being built by Luerssen Australia Pty Ltd. The contract requires a four-fin system, including Quantum’s revolutionary Zero Speed™technology. Since 1985, Quantum has dominated the superyacht (50m+) stabilization market and over the last 15 years they have provided solutions and systems to the US Coast Guard, Navy and 14 international foreign navies. In addition to Quantum’s advanced stabilization systems, they also provide a worldwide network of customer service, parts and support. Quantum is a privately held corporation that manufactures stabilizer systems for the military, yachting, and commercial markets. With three world patents secured, and the inventors of Zero Speed™, XT™ (extendable) finunits, Dyna-Foil™ and MAGLift™, Quantum has revolutionized the marine industry, adding unprecedented comfort at anchor and underway. To date, well over 1,000 vessels rely on Quantum’s technology to provide superior ride and roll control to its users. Since 1985, Quantum has been known for perfecting the art of stabilization and famous for exceptional global service.